Tynga of Tynga's Reviews is starting a new meme to spotlight the books we receive each week. She explains at her site. She also does a very nice vlog each week showing her books (and hopefully her new baby). Another option is Mailbox Monday which was originally started by Marcia at A Girl and Her Books. She hosted it for a long time but in April 2010 she decided to make it a traveling meme. You can see all the details here. You will also find a list of the 2012 hosts. 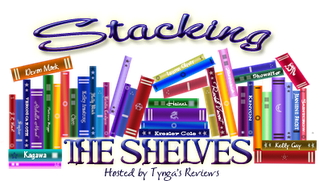 Martha from Reviews by Martha's Bookshelf will be hosting in May. I guarantee that your TBR pile will grow when you see all the wonderful books everyone gets. You will also discover lots of great blogs and lots of books that you won't be able to live without. 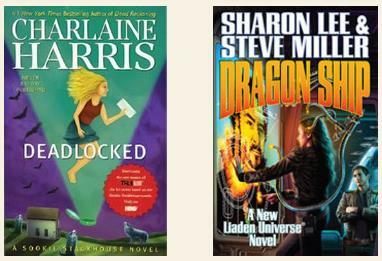 Deadlocked by Charlaine Harris is the twelfth book in the Sookie Stackhouse series. I needed to find out what was happening in Sookie's complicated life. This was a quieter book that is tying off some plot threads but was still very enjoyable. It is hard to believe that the next book will be the last one in the series. I have been reading this series since 2001. Dragon Ship by Sharon Lee and Steve Miller is also a new entry in a long-running series. It is the fourth book in the Theo Waitley series but is the fifteenth book (I think) in their larger Liaden Universe series. I love these character driven science fiction stories. I bought the eARC the day it was available and now have to wait months until I can hold the print book in my hand. Heart of Brass by Kate Cross is the start of a new steampunk series for adults. I am almost certain that she also writes young adult steampunk under the name of Kady Cross. Both seem to by pseudonyms for Kathryn Smith who also writes romances. The Last Boyfriend by Nora Roberts is the second book in the Inn Boonsboro series of romances with ghosts. This one is right near the top of my TBR mountain and should be read soon. Royal Street by Suzanne Johnson was added to my stack because of the great cover and the great reviews I read about it online. I couldn't resist this new urban fantasy that takes place in a post-Katrina New Orleans. What couldn't you resist this week? Oooooooh, Royal Street is on my Wishlist! I have yet to read the Sookie Stackhouse series but, since I am hosting a Sookie challenge, I'm planning to tackle it this year! The last three are all on my tbr. I love Nora Roberts and the Kady Cross series so this new series should be good. Great haul! it is so confusing to see all of these different IMM recreations. It is like everyone wants theirs to be THE replacement lol. I'm just posting my books but linking it to anyone in particular! The covers for this haul are beautiful! I loved Royal Street - it was a very cool UF read! I can't believe that Sookie is going to finish, but then in her timeline its only been 2 years since the first book! Deadlocked and The Last Boyfriend are on my wishlist! I haven't had a chance to read Royal Street either! Enjoy your stack of books this week! I really need to buy a copy of Royal Street! Awesome Haul! Can't wait to hear your thoughts! Deadlocked! I can't wait to get that one and start reading it. Really crossing my fingers that it's better than the last few. The Last Boyfriend! I read the prequel, and didn't really love it, but I hopefully will read the rest of the series. Nice! I got Charlaine's book as well, but won't be getting to it as quickly as I want to! Happy Reading! royal street was awesome! and I'm reading deadlocked. I hope you'll enjoy all your new reads! happy reading! I did the same thing with Dragon Ship. I love this series but now have to wait for the hard cover and then for the next book. Your other book look good too. Summer Reading! Have You Made Your List Yet?